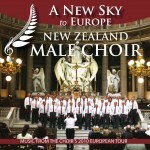 This CD celebrates the release of New Zealands Philip Norman commissioned composition “A New Sky” that was first performed on the choirs European in 2010. The CD also features Opus 127 “Messe” from Josef Rheinberger that the choir performed in LA Madeleine and Notre Dame in Paris, Salzburg and in St Stephans Dom in Vienna. 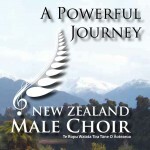 “A Powerful Journey” was recorded in Christchurch in 2008 and represents a broad selection from the choir’s repertoire. Male voices offer the listener an exciting range of tones and nuances that are heard through the variety of songs presented. This CD seeks to provide broad appeal from soul to classical, jazz to traditional choral. Four part harmonies evolve to eight part complex harmonics to the pure but difficult unison chorals.